Travel theme: Walls | Where's my backpack? I just heard Pink Floyd’s ‘Another Brick in the Wall’ on the radio, which reminded me of the photos I took of the section of the Berlin Wall in New York and the amazing translucent marble walls of the Beinecke Rare Book & Manuscript Library . That got me thinking about other walls I have photographed and before I knew it, I had this week’s travel theme. Camden Market in London always offers up great photo opportunities, but my favourite area is Stables Market, a converted Victorian horse hospital which is a maze of cobbled streets and tunnels. The walls are adorned with ornate friezes; here is a section of one of them. No hike along the Irish seafront would be complete without at least one great stone wall. During a hike around Howth Head one blustery December day I spotted this one. 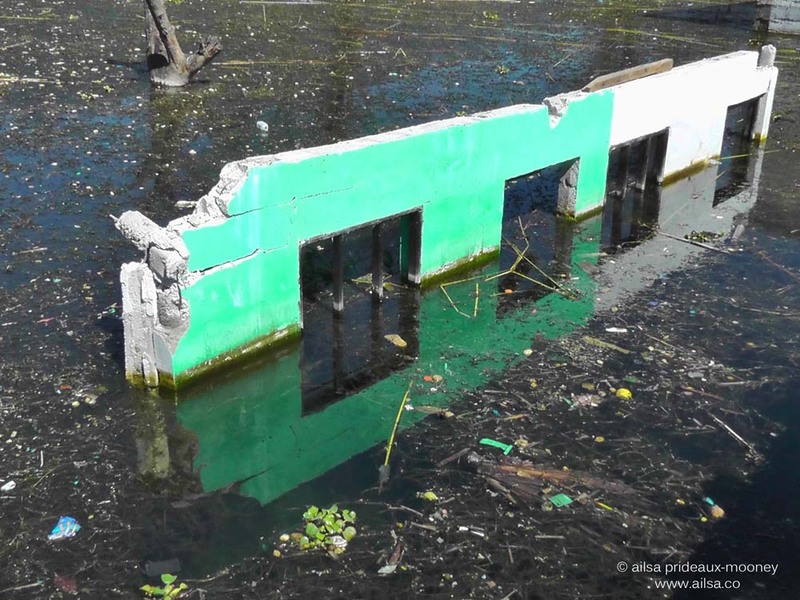 When I was visiting villages around the edge of Lake Atitlán in Guatemala, I noticed many waterfront buildings half-submerged by the rapidly rising level of the lake. Fragments of wall bore witness to what had once been a thriving business or someone’s home. Along the Asbury Park boardwalk in New Jersey, there’s an amazing old casino. It’s just a shell of a building today, but its interior still shows the traces of its glory days. Don’t be a fly on the wall – join in the fun! Looking forward to your post. 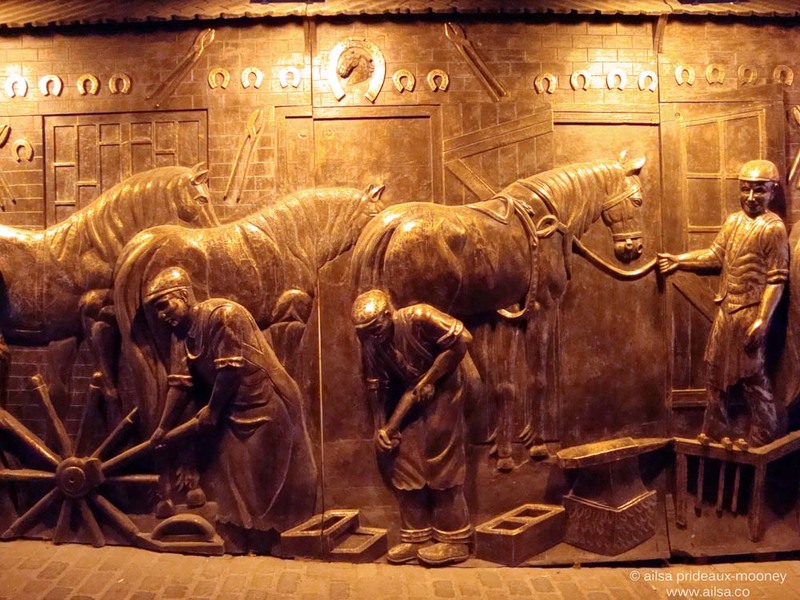 This entry was posted in Photography, Travel, Weekly Travel Themes and tagged architecture, history, photography, photos, pictures, travel, writing. Bookmark the permalink. These are all marvellous! How will anything compare to these? Beautiful! I just completed an album on Wall Art in Buenos Aires (http://www.facebook.com/media/set/?set=a.328341483941599.71173.162629397179476&type=3). I will now consider “joining the fun” by next Thursday! Good one, Biocadence, looking forward to your post! Love the roundabouts. Thank you! It’s so fun to see you capturing the beauty of funky walls. I love the distinct shots you got! haha! I am not sure. I do know that we were the only ones I saw planking during our time there:)! Hey Ailsa, love this weeks theme, here is my take on it inspired by wall carvings at ancient historical sights Angkor Wat and Chichen-Itza…Enjoy! The half underwater wall is coolest, and saddest. I like the meremaidopus too. It was sad to see the flooding, Mark, the lake level had risen by about 3 metres and was still rising. Wonderful shots – for your walls … have you been in Berlin??? 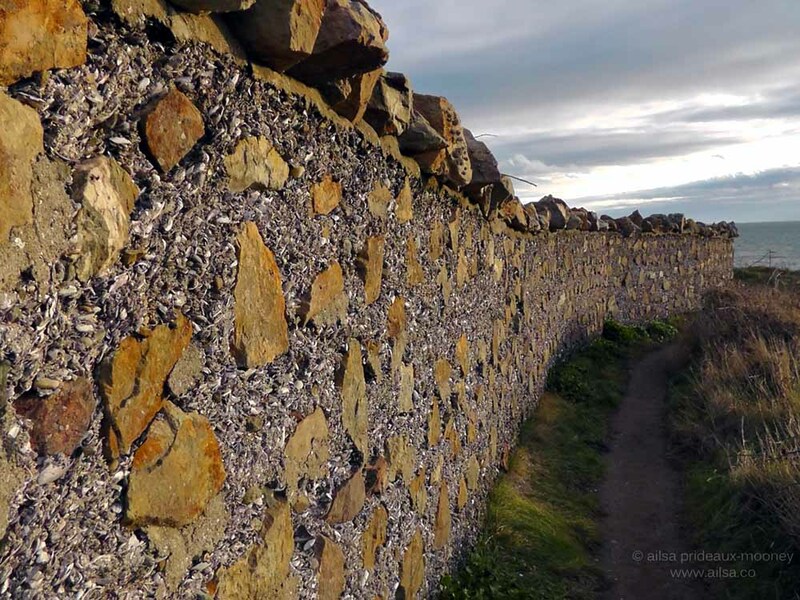 All of your wall have a powerful story to tell – my pick has to be the stone wall at Howth Head. Yes, one of my favorite in Europe … up there with Barcelona. Such great photos you have displayed for this week’s challenge. Here is my selection. Hope you ENJOY!! I really like the first wall and the last one. I love Pink Floyd. Ah yes, I am quite partial to Pink Floyd myself, Connie. Wish You Were Here is a classic. You found some great walls- what is the binder in the second shot? There were tiny little shells mixed in with what looked like concrete, brilliant idea because the shells caught the light and sparkled beautifully. They surely did- great photos!! Wondrous selection of walls, Ailsa. I went to see your Berlin Wall post too. Fascinating. Not as amazing as your shot of the New Jersey wall. Lovely, mostlymonochrome, that bottom one with the slashes of paint is wonderful. That casino in New Jersey was a real joy to find, such a beautiful building even though it was almost falling apart. This was an enjoyable theme – as always! Here’s my entry! I like the wall in Howth Head. Walls is a great theme for photos! Ailsa, Your Berlin Wall inspired me. Haha, Robert, what a great post. That Ellen deGeneres quote cracked me up, and I love how you started with the Berlin Wall and then went on a journey. I like that Ephesus wall too, you’re not alone! I have a friend who grew up near Asbury Park, she’d talk about it all the time. Haven’t seen her in a couple of years, so thanks for reminding me of her. And in Mexico there’s a belief that if you paint your walls that shade of blue, like your shot in Guatemala, it’ll keep flies out of your home; guess it doesn’t work when there’s no roof. I would need to have rocks in my head to wear an earring, especially that one! I love the Pink Floyd hook. Nature’s such a vandal! Wonderful capture, Allan! Love the theme and the pictures, Ailsa. Here are some pictures from the NYC Subways…they never stop surprising me…..
Pingback: Walls.. Part One… | Ouch!! My back hurts!! 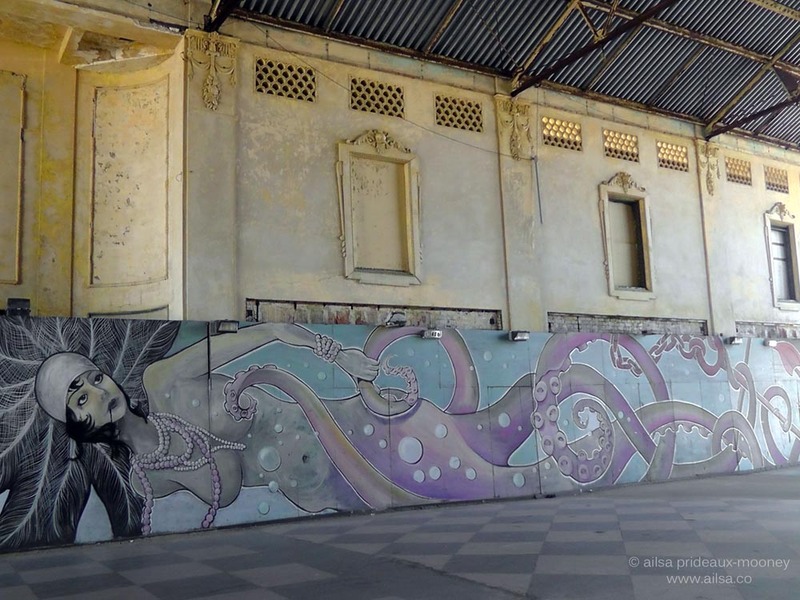 I love the horse market wall and the mermaid/octopus! Here are my walls – http://newpillowbook.wordpress.com/2013/01/25/travel-themes-walls/.